Although I own 2 tents, my idea of camping is to stay at a Holiday Inn. So normally, my portable operations aren't great overnight Adventure Radio treks, but day hikes into pleasant countryside. My QTH (Essex) is not renowned for rugged mountain peaks, although I am in the hillier part of the county and adjacent to the Epping Forest. However I used to occasionally go backpacking, mainly in New Hampshire, Maine or the Pyrenees. Most years, I also visit the Alps, usually in Austria, to enjoy mountain hiking and sometimes take a rig along with me to operate from the campsite or infrequently from the trail. In my experience, one should be clear regarding the objectives of carrying a rig along on a hike. Unless the primary goal is to operate from a specific location, I tend to find the rig to be an unwanted distraction and excess weight to carry. I used to carry a 2m HT as I thought it could be useful for emergencies, but had visions of some lid asking me for a SOTA or grid number or similar trivia, so gave that up. My favourite portable rigs are the Small Wonder Labs DSW20 and DSWII-40 which although restricting me to a single band, makes the antenna system easier. These excellent little rigs have DDS VFOs, which makes for stability. The optical encoder is detented, so the VFO can't be accidentally knocked off frequency, which is an occupational hazard during portable operation. 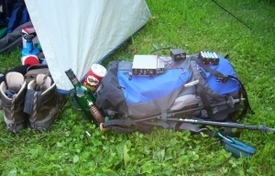 The photo below was taken during a 40m portable operation as OE9/G3VGR/P at a campsite in the Montafon Valley, probably my favourite hiking area. As shown in the picture, I normally carry a battery pack of ten 2.4Ah AA NiMh rechargeable cells, Palm Mini-Paddles and ear buds, which makes for a compact station. An added bonus with the DSWII is that the case is steel, so the Palm paddles fit nicely to the side using the magnetic base. 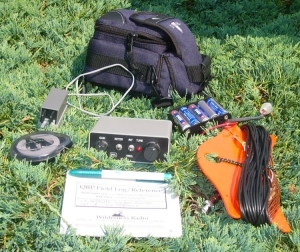 The antenna used in the photo was a 67ft longwire matched by a simple parallel tuned ATU with LED SWR Indicator. I also took along a lightweight 40m dipole fed with RG/174U coax. A useful addition would be to make to make a small, lightweight collapsible operating table to fit in my backpack. Using the backpack itself or wet grass as a table isn't very satisfactory. 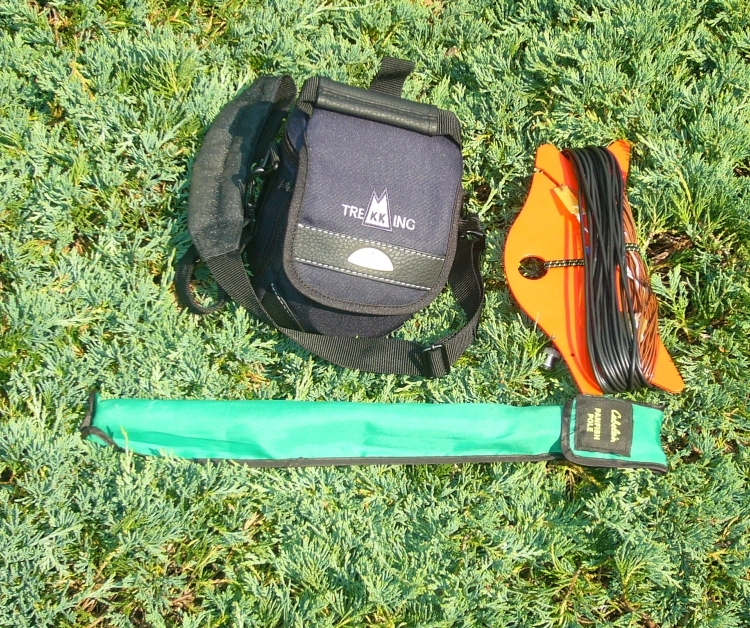 The big advantage of operating outdoors is that there is plenty of room to erect antennas. 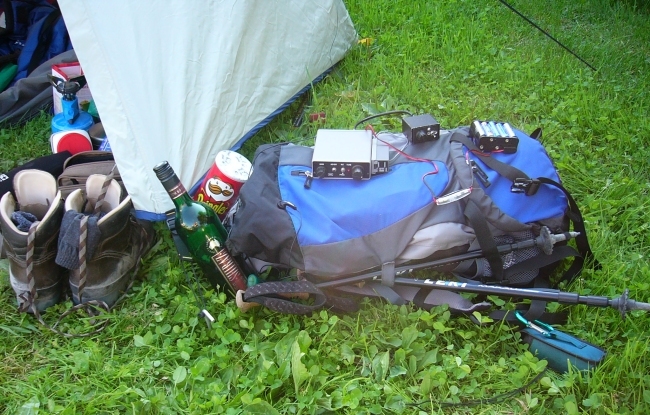 I can never understand why some QRPers handicap themselves with inefficient shortened antennas when in the field. If operating solely on 20 metres, my normal antenna is an end-fed halfwave. This is quick and easy to erect and I normally configure it as a sloper. This only requires one support, which is normally supplied by a friendly tree. If above the treeline or elsewhere devoid of trees, I have a Cabelas 14ft Panrod which is lightweight and collapses to quite a short length. I use velcro straps to attach the fishing rod to a signpost or other suitable support to achieve more height. On 40m, I normally use a dipole, fed with RG174U, which can be erected quickly at a low height and is very effective for NVIS operation. I can easily make contacts around Europe with 3 watts on 40 metres. For reliability, the RG174U feeder is terminated with a phono plug and I use a phono-BNC adapter to connect to the DSW-II Antenna socket. This removes the worry of a BNC plug failing in the field, as the ones designed for use on RG174U don't look too sturdy. For lightness and strength, the wire antennas use 26awg copperclad steel wire (type #534) from The Wireman. To prevent tangles on this type of wire, I've found G3CWI's Wire Winders to be very effective.